（1）Elegant retro stand collar design, Pretty up neck.Straight placket, Retro manual knitted buttons. Comfortable shoulder design.Cuff blank pressing; Cuff leveling. No Side slit; Hem blank pressing; Hem edge leveling. （2）Material：98% mulberry silk (watered gauze) ; 2%polyurethane fibre. Lining：100% Polyester fibre. Filler：100% silk wadding. Color: 88-1, 88-3, 88-4. Printing patterns. 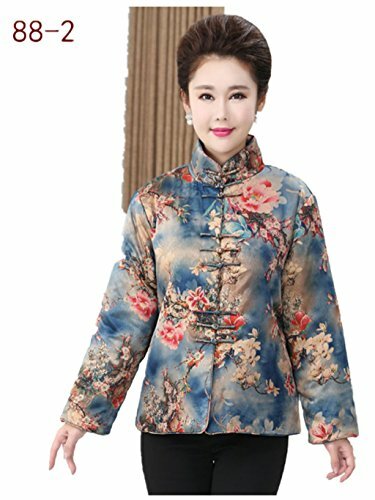 （3）Double-deck; thickened; keep warmer ; good softness; nonelastic; durable; Stereoscopic cutting; Beautify the body; Printing pattern ; Outside one pocket on each side; the appearance is elegant and tasty.